Even as I write this, our nation continues the heated debate over health care reform. As a former college instructor in Economics, a current disability ministry leader, and the parent of an adult with Down syndrome, this topic captures my attention—and my heart. The discipline of Economics can be described as “the study of the allocation of scarce resources to alternative and competing wants.” Or in simpler language: limited resources and unlimited wants. Who gets what? And who chooses? In a postmodern context where we as a culture will not acknowledge nor agree upon a set of transcendent values, the dialogue over important issues breaks down. But we as the Church do have a set of transcendent values rooted in the holy character of God. We also know the nearness of God in Christ, who has shown us what the costly, voluntary, sacrificial love of the Father looks like in everyday relationships with others. And because of Christ’s costly, voluntary, sacrificial love on Calvary—followed by his victorious resurrection—we have the indwelling, life-transforming power of the Holy Spirit. He gives us the wisdom, strength and courage to act on what we know is good and true according to God’s Word. In other words, you and I are without excuse. In the Parable of the Great Banquet in Luke 14 (which could be titled the Parable of the Great Excuses), Jesus tells us to “Go out quickly to the streets and lanes of the city and bring in the poor and crippled and blind and lame.” According to Jesus, his love is not dispensed by the government or sold by a corporation. How much love have you and I been sharing lately with those who are marginalized by society? Valuing the sanctity of human life means much more than articulating accurate theology. It means living out our theology, as Joni Eareckson Tada says, “with our sleeves rolled up.” I would suggest that the sanctity of human life is not as much about what I am against as what I am for. It is about being for the life of my neighbor—from conception to natural death. Every human life is the inseparable intertwining of a physical body and a spiritual person. We cannot minister to the one without ministering to the other. That is why the gospel—the good news of the coming of the Kingdom—comes in word and deed. The Parable of the Great Banquet extends an invitation of honor—given with urgency—and follows with a meal that meets the real needs of thirst and hunger, both spiritual and physical. I trust that you recognize that, no matter who “wins” the current round of the health care debate, we are living in a time when the allocation of scarce resources to unlimited wants will increasingly affect the lives of the most vulnerable in society: the elderly, the disabled, and the unborn. It is an economic reality with eternal consequences. And that weighs heavily on my heart because we, the Church, are not ready for the task. 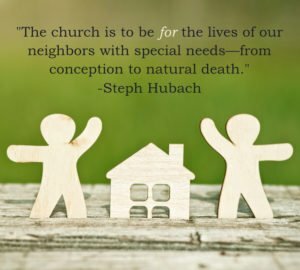 The Church is to be for the lives of our neighbors with special needs—from conception to natural death. Will our congregations go out into the streets and alleys and find our neighbors with disabilities? Will we pass out the invitations to the Great Banquet with a passionate sense of honor and urgency? I challenge you to consider that the Great Banquet is never fully experienced by any of us until all of those who Jesus intended to be there are there.